A trade show was not a part of the very first NILE Stock Show. However, due to the nature of the NILE itself – many people gathering in one spot – it was only natural that a trade show would evolve. This year the Western Expo, which runs from Wednesday, Oct. 16 through Saturday, Oct. 19, includes not only a trade show but many other events as well. The NILE trade shows have always featured exhibitors with exquisite western art or jewelry, saddle, tack and western ware as well as livestock equipment, feed and supplement, and cattle genetic-based companies. "This year we are sold out," says Justin Mills, "that hasn't always been the case, but this year we have had a lot of interest with vendors coming in to the NILE." Several years ago, the NILE began adding other events in association with the NILE trade shows. 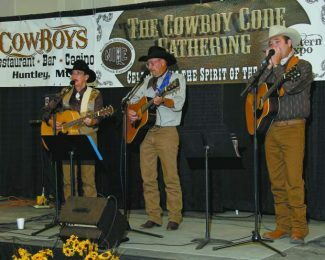 Each day free entertainment including western music and poetry will be held on the Cowboy Code Stage. New this year is the Cowboy Code Gathering held each night after the rodeos at 10 p.m. at the Dude Rancher Lodge. 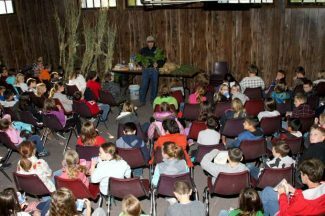 The Young Guns Zone sponsored by Two-W Livestock Equipment is back again this year as a unique area just for kids of all ages. "We wanted to provide some activities that would not only bring families to the NILE but offer them a fun experience," says Mills. Each day kids will have the opportunity to participate in Pony Ride, Rodeo Star Autograph Session at 2 p.m., Mutton Bustin' at 3 p.m., Stick Horse Rodeo at 5 p.m., and much more. There is an entry fee of $10 for kids to participate and winners from each round during the day will be able to compete in the evening rodeo in Rimrock Auto Arena. The Mutton Bustin' that will take place each afternoon at 3 p.m. is for kids that are 4 to 6 years old and under 45 pounds.